Fremantle’s historic High Street is looking a treat, with a number of properties getting a facelift in conjunction with the removal of the Arcs d’Ellipses artwork. The artwork was installed in 2017 as centrepiece of the inaugural Fremantle Biennale, High Tide. City of Fremantle Director of Infrastructure and Project Delivery Graham Tattersall said while the difficulties in removing the artwork have been very unfortunate, an unexpected benefit has been that High Street is now getting a much needed makeover. “The approved budget for the removal of the artwork was $211,000 and the works are currently proceeding on budget, with 16 of the 23 affected buildings completed,” Mr Tattersall said. “The City is very conscious of the potential impact of the works on local businesses and has been in close communication with businesses and property owners throughout the removal process in order to minimise the disturbance. In addition to the removal works the City is also making other improvements in High Street by repainting the lamp posts, fixing the kerbs and installing new benches and planter boxes. High Street resident Rob Harrison said the Arcs d’Ellipses artwork was a welcome addition to the West End. “Overall it’s been a pretty spectacular piece of art for Freo. 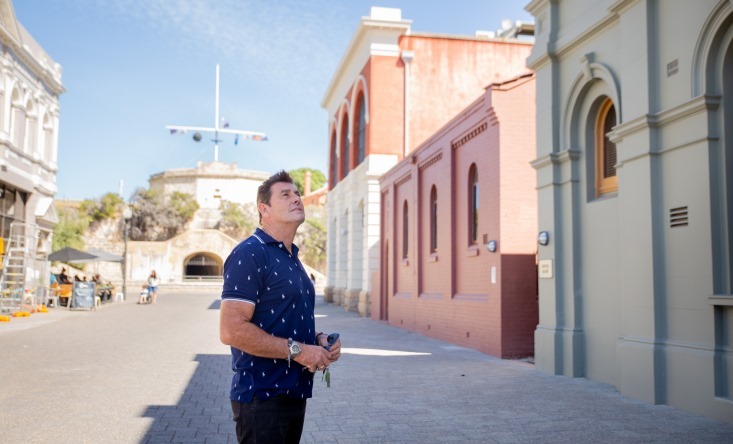 People have come to Fremantle to see it and they haven't been disappointed,” Mr Harrison said. “I watched them climb the Round House stairs and look down High Street at the artwork completely amazed. It was quite entertaining to see them smile when they looked up toward the Town Hall. “Getting it off has been an issue, and a few people haven't been happy, but the good thing is buildings that haven't been loved for a long time, are getting a new lease of life. You can walk down this street now and it's looking very special. Danni Theseira from Chalky’s café said the artwork was good for their business. “There were a lot more visitors who came just to see the art that hadn’t been to Fremantle in a while, as well as tourists who had seen the images on social media,” Ms Theseira said. “It certainly improved trade for us, as there is limited foot traffic at the far end of High Street. “Installations such as these are very welcomed by us and we would most certainly encourage any activation at this end of High Street in the West End in the future. “There has been a lot of noise in the community around the removal and additional cost, and some genuine disruption for us too, but the benefits of bringing things like this to Fremantle far outweigh the inconvenience. Department of Planning, Lands and Heritage Director General Gail McGowan said the State Heritage Office had been keeping a close eye on the removal works. “The Department has been kept informed by the City of Fremantle about the removal of the Arcs d’Ellipses work along High Street and is pleased with the progress of works,” Ms McGowan said.